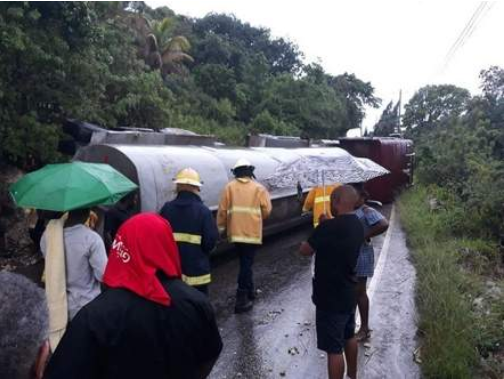 A truck that was carrying molasses has turned over and blocked Spur Tree Hill moments ago. This means that the road that links Manchester and St. Elizabeth is now impassable. The weather has been very bad in the area with heavy rainfalls. This likely played a role in the accident. So far there have been no reports of any serious injuries and there are no deaths. The truck spilt its content on the road and that has now caused major safety hazards. The rain mix with the oil means that the emergency team will have to clean the road before users can use the road again.